Subject: Investment advice even I understand! With Enron, you would have $16.50 left. With World Com, you would have less than $5 left. But if you had purchased $1,000 worth of beer one year ago, drank all of the beer, then turned in the cans for the aluminum recycling, the REFUND would have been $214. Today , I decapitated a mouse and dropped its headless body at their feet. I had hoped this would strike fear into their hearts, since it clearly demonstrates what I am capable of, however, they merely made condescending comments about what a “good little hunter” I am. 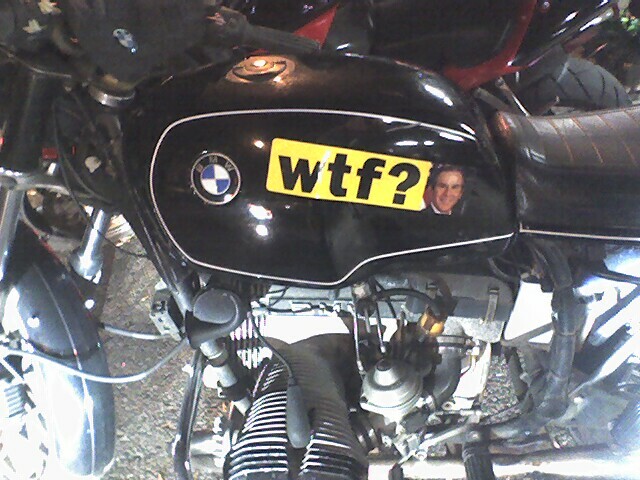 While I debate the effectiveness of a bumper sticker on a motorcycle, I dig the l33t 5p3@k.
The Center for Disease Control has issued a warning about a new virulent strain of Sexually Transmitted Disease. The disease is contracted through dangerous and high-risk behavior. The disease is called Gonorrhea Lectim and pronounced “gonna re-elect him.” Many victims contracted it in 2004, after having been screwed for the past four years. Naturalists and epidemiologists are amazed at how this destructive disease originated only a few years ago from a bush found in Texas.